Thank you for following along on this easy and stunning before and after basement craft room makeover, which was originally shared in September 2015. 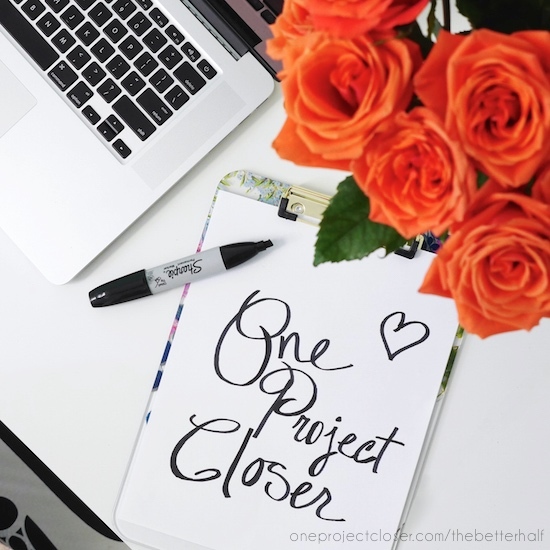 We hope you feel inspired and stick around to get to know us a little better here at One Project Closer! Not very exciting, huh? Yet more of the Builder Beige that consumes my house (not putting that down, I just like gray or off white instead as a nuetral). 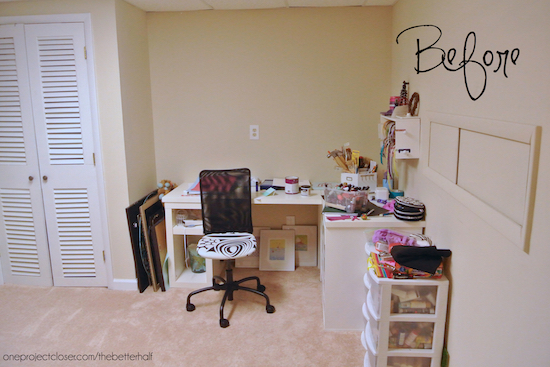 But I think one of the reasons this craft room makeover is my favorite is because it is all mine! While I am the prominent influence over the decor in our house, I try to take everyone else’s preference and the desired mood for each room into account. I rarely choose bold and bright colors for main living areas because we want a calm place to spend time as a family. But not this room. Give me BOLD. Give me COLOR. Give me AWESOME! Also, this was a pretty inexpensive makeover, in all. I already owned the IKEA desk and chair, but that wasn’t very expensive. 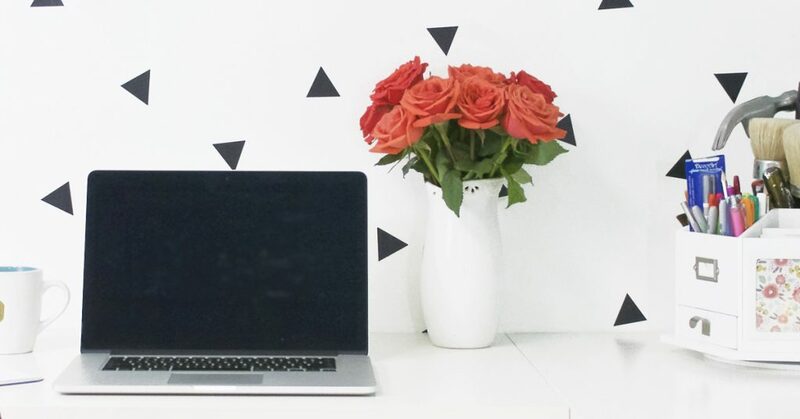 I made these DIY watercolor paintings which were SO EASY, and used my Silhouette Machine to make the black triangles, scissors, “be awesome,” and the keyboard ampersand art with adhesive vinyl that Expressions Vinyl sent me. And I topped it all off with my new light from Color Cord which they sent me to help promote past giveaways. I should also mention, one of the challenges in this room (in addition to the lack of windows and presence of fluorescent lights) was this weird box on the right that provides access to the water main. So for obvious reasons, I couldn’t close it off or cover it. So “be awesome” was my attempt to make it look more like decor and less like access for axe murderers. Oh and I’m in love with this paint from Behr (Aqua Wish) – bright without being neon, and just the right blend of blue and green! I’ve shared this pic before, but I was digging these flowers Ethan gave me for my birthday last month and doodled a quick “One Project Closer” with Sharpie for the photo shoot. What do you think? What is your favorite room? 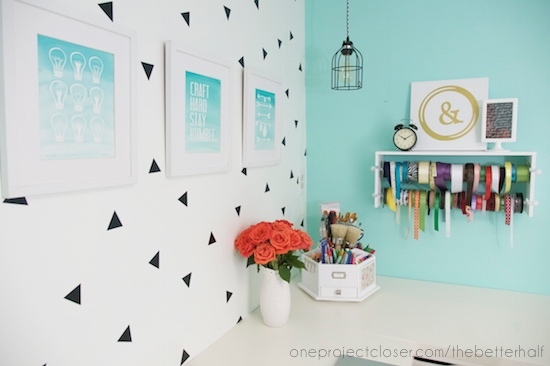 What are your tips for a basement craft room makeover?? I love EVERYTHING about this!!! The color, the lamp, your artwork. So pretty! thanks so much vanessa!! I am so honored by your kind words! Just beautiful!! The colors are perfection!! Oh my gosh Jocie, what a difference! 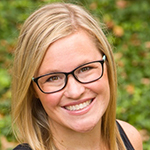 You have one fabulous eye for design girl. Loving the bright, happy colors for a basement space too. Pinned to my Craft Room Board. Jocie!!!! It’s amazing!!! 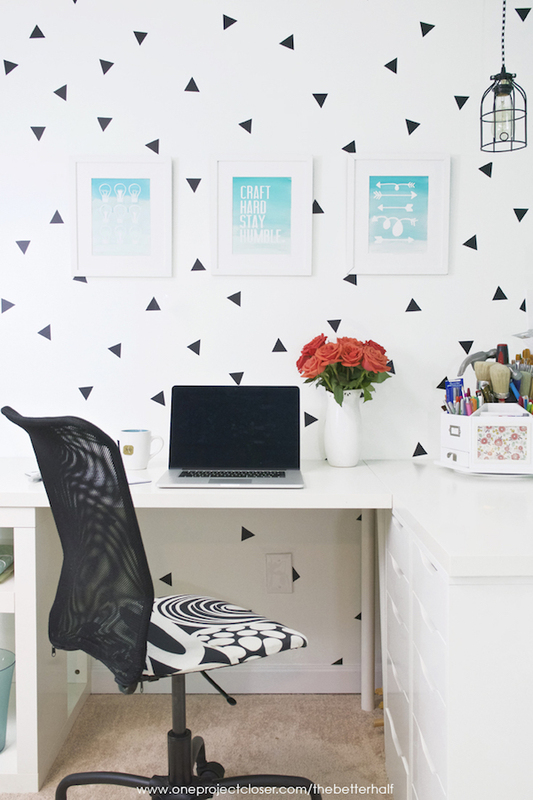 The color is fabulous and the black and white triangles are so fun! I love every little detail. 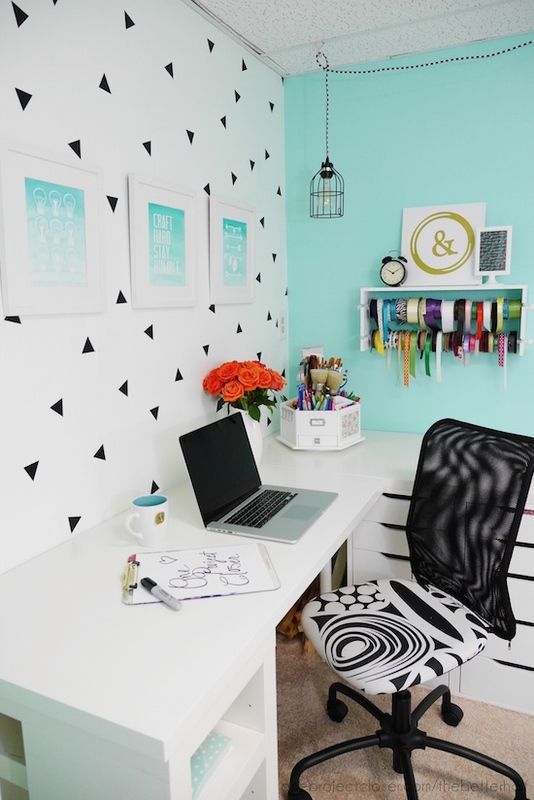 What a fabulously creative work space … why, oh why don’t have basements in FL?! (Well, water table and all that jazz, but whatev.) I love the bright color and the fun accents! Who wouldn’t be inspired to create here? Very pretty! I’m sure you were glad for that corner of your own before but making that corner so adorable now…. who wouldn’t find inspiration! do you remember the specific name of this desk from ikea? IKEA!!! I’m still using it and loving it! Found this on pintrest so adorable! May i ask where you got the desk its exactly what i want for my room! Love this set up. Are both desk top the same size? Do you know the length of these table tops. It will be greatly appreciated. Parabéns! ficou maravilhoso! Estou tentando montar o meu mas não tenho essa visão! What color is the paint? I really love the color and I’m going to paint my room. Such a beautiful space. We see lots of creativity being cranked out of here! This inspired me so much! We have the aqua wish and pure white on the walls now. I’m already in love. Can you tell me how big your triangles are? My guess based on the mug is 2” x 2”. Thank you! !